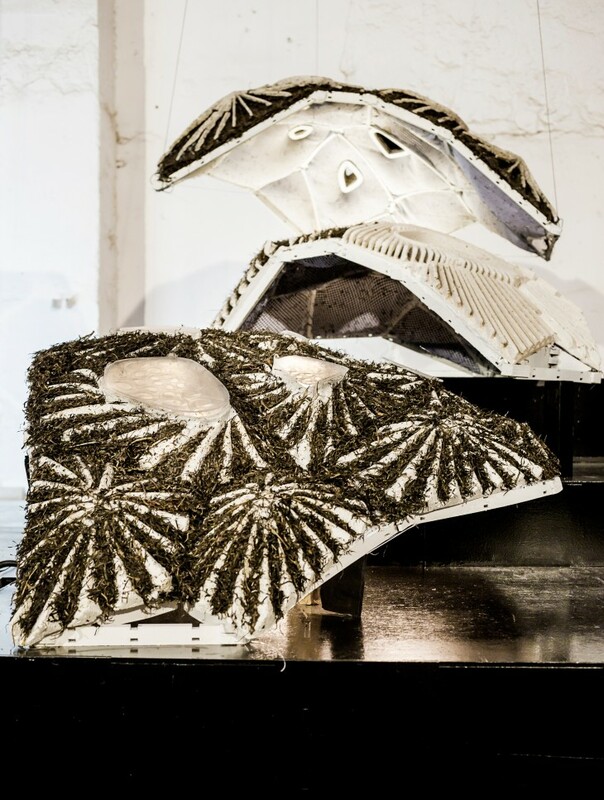 This thesis is dealing with how buildings can be a host for the nature by using seagrass as roof material. The goal is global usage, helping to decrease the emissions of greenhouse gasses worldwide by hosting a productive vegetation. 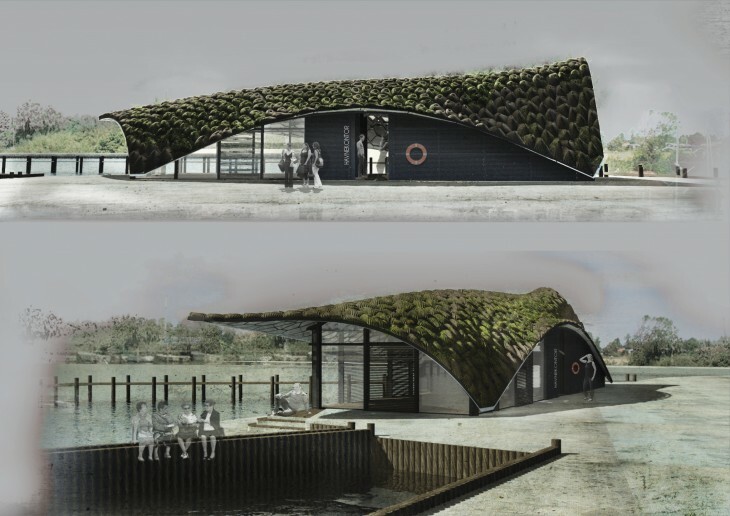 The goal is reached by combining ancient thatching technique with seagrass learned from Læsø (Denmark) with modern digital fabrication and computational design. 1) Aesthetic. Harsh and subjective “ugly” looking appearance. I will study how seagrass can be used in a different manner to get a more appealing appearance in a contemporary context. 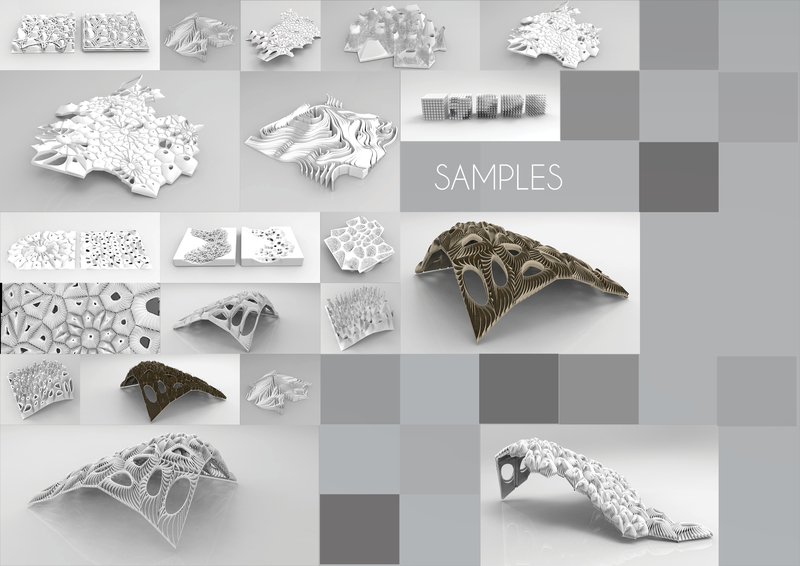 This part will be based on computational form finding but will also look into morphogenesis, geometrical patterns and physical prototyping as tools of finding appropriate shapes and forms. Theory from scientific papers and theory in bio-materials will ground the proposals which are suitable for the properties of the material. 2) Material usage and limited inclinations. A big quantity of seagrass is used in order to make the roof water proof, and the existing roofs only work with an inclination between 30-45 degrees. Research and theory based on bio-mimicry and environmental analysis will provide a system to make a more efficient section of a new roof typology for seagrass which also can be functional in different inclinations. 3) Unintended ecology. The small ecology of plants grown on the roofs are not controlled or optimized. For a seagrass roof to be an even more appealing sustainable alternative to traditional structures, the ability to grow vegetation in the material needs to be more present in the design. 4) Inhabitable spaces. The roof structure is 100% closed. The consequence is that no daylight enters and that the attic therefore only serves as an inhabitable space. I will aim to change the function of the roof-system to be a habitable space. I have always had a big interest in the link between nature and architecture. 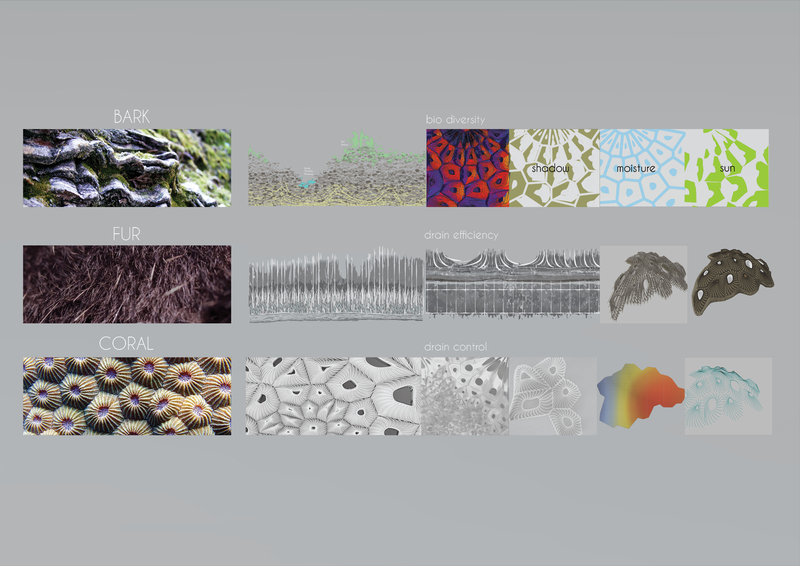 In all of my project so far, the nature has been a driver for my design approach. The landscape of my native Denmark has changed drastically from a landscape characterized by a big diversity of small farms, animals and crops into super farms and continued lands of the same type of crops and no animals visible. I grew up in a small village surrounded by an oak forest near Copenhagen in Denmark. I experienced the difference and the impact between nature and the city. Slowly but steadily the city has expanded into the woods and left scars in the forest. Some parts of the forest I cannot even recognize anymore. The expansion of the city has not taken into account how to repair the forest again or how to live in it without destroying it. I find this very disappointing but it also encourages me to work for a better dialogue between nature and architecture. In the 20th century major technical inventions such as planes, space travels and the internet have been integrated into our lives. Most of the inventions were made without taking into account the usage of none renewable materials and the global carbon budget. The 21th century has showed us the limits of our relative small planet. We now know for sure that the world is changing, and we soon will ran out of the many natural resources which most of our technology is based on. So we find ourselves in a crisis, lacking natural resources that we are dependant on while exploiting the nature that provides them. The link between architecture and nature is universal. Mankind has always been interested in this subject. However, many contemporary buildings are to a large extant distant related to the nature rather than working actively and closely with the nature. We are standing in front of a global problem that we need to tackle. The logic of this thesis is based on the understanding that the problem could be solved by letting the nature in instead of cutting it off. We have been relying our design approach on common ways to construct and think our architecture although our tools and knowledge have changed drastic during the two industrial revolutions. A building is still constructed by static materials. The materials are separated from their natural growing behaviour, and when a building is constructed, it is just waiting to be torn down and being replaced by a new and smarter one. We see that happening a lot in suburban areas worldwide where new condos and skyscapers are built all the time and farmland trusts and other activitists have to fight in order to keep some land green. We have developed a use-and-throw-away-culture. We do not expect our buildings to perform better during time as in the nature. Digital computational architectural design has mainly been focused on static and non-organic materials. There seems to be a small amount of research working with organic materials. The main architecture of today has no life, does not produce oxygen and it is a one-way transfer of energy from the nature to the man-made environment. To change this unsustainable way of energy usage, some architects aim to find a better dialogue between nature and architecture. I would like to be one of them and therefore my research seeks to recreate a (lost) dialogue between nature and architecture. Hence, my challenge is how it is possible to let the contemporary static architecture turn into a living organism which can be a host for the nature. 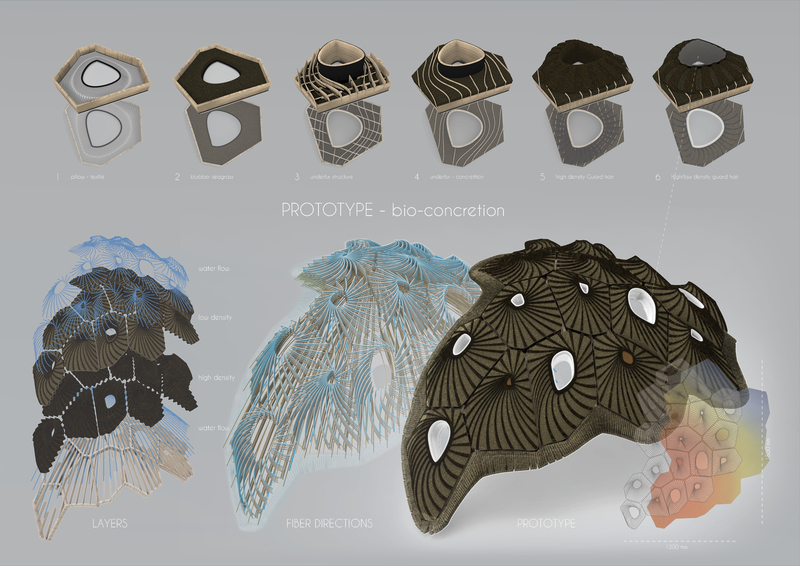 A living architecture that will respond. 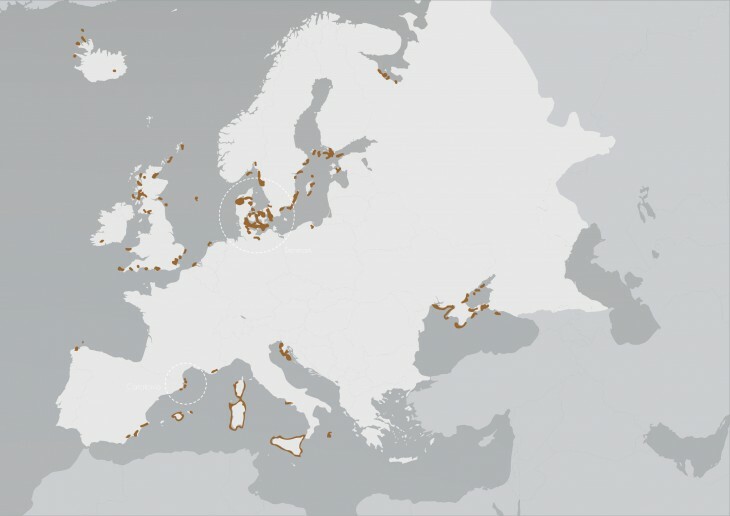 The specific research started with the fascination of the material, seagrass (eelgrass), which has been used as roof material in the small island Læsø in Denmark for over 300 year. Læsø was lacking typical building material to construct their houses with because of the harsh weather condition on the island. So they had to look into alternative solutions. The sea had always been the main element and influence to the citizens of the island, situated in the middle of the sea of Kattegat, so it was likely for them to observe what the sea could provide them with. They tried with seagrass. Seagrass is a waste product from the sea which can be collected on the beach and dried to be used as a building material. The seagrass were laid directly on the roof beams, and the roofs were gradually getting more sealed over the years, given the houses a shelter from the weather conditions. Over time the roof started to merge with the nature while plants and organism started living on the surface of the seagrass, without damaging the roof. The houses became hosts for the nature. The seagrass served several functions for the houses: insulation, roof cladding and membrane. It also worked as a fertilizer and “soil” for growing plants. The result was a heavy massive roof with its own unintended living ecology. Many of the houses are still intact on the island, and this proves that the usage of seagrass as roof material has longterm properties. All the houses have more or less the same type of typology of construction. The get the roof sealed and water proof, the section of the roof is sometimes up to 1,5 meter in depth which means a lot of seagrass is used to construct it, and all the roof inclinations are limited between 35-45 degrees. 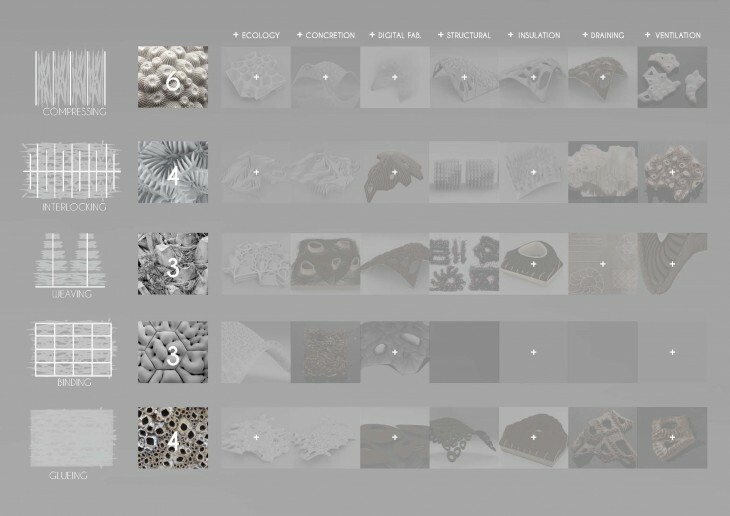 Nowadays, this material usage and limitations will not be suitable and this need to be optimized to work in a contemporary context. The roofs made by seagrass has a kind of “bad taste” and lack of sophistication as well which means that many will not describe them as beautiful in a traditional sense. However, I think they have great and interesting potential.. Seagrass roof can titillate us and tempt us to use terms like organism, and I think it calls on a discussion of the importance of beauty in architecture and the origin of natural forms and shapes in nature, which I am tempted to call the origin of beauty or grace. Therefore, I will look into the concept of the morphogenesis theory based on Alan Turings ” The Chemical basis of Morphogenesis” and D´Arcy Wentworth Thompson´s “On growth and form“, which are some of the most important founders of the theory behind understanding the order of geometries and therefore grace in the nature. By studying the properties of the material, its process and aging process, it shows that seagrass possesses the special characteristic that it hardens over time – and that it is this hardening process which, in particular, creates the seagrass roof shapeless surface character. This kind of process is known, in the science of geology, as the process of concretion formed from mineral precipitations found in sedimentary rocks and soil. This mechanism gives the material of seagrass another very specific and rare dimension than other standard building materials: Time. To amalgamate the ancient technique of constructing the roofs of seagrass with a more contemporary design language calls for a new transition. 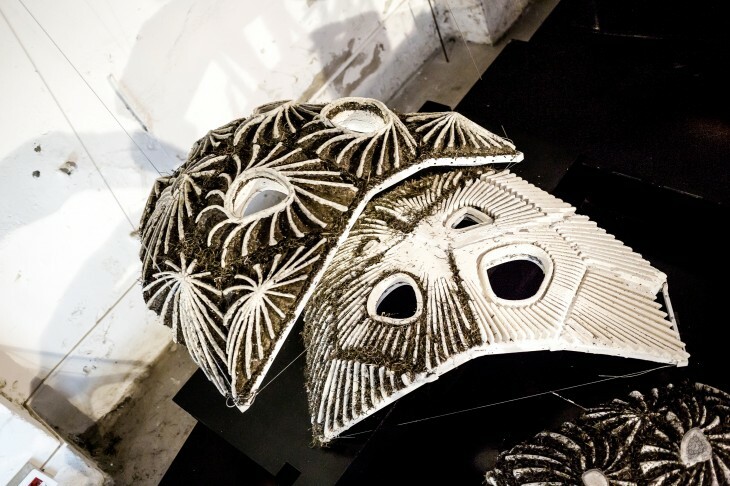 The typical seagrass roof is based on manual labour and the new typology will be based on digital fabrication which is the paradigm at our time. 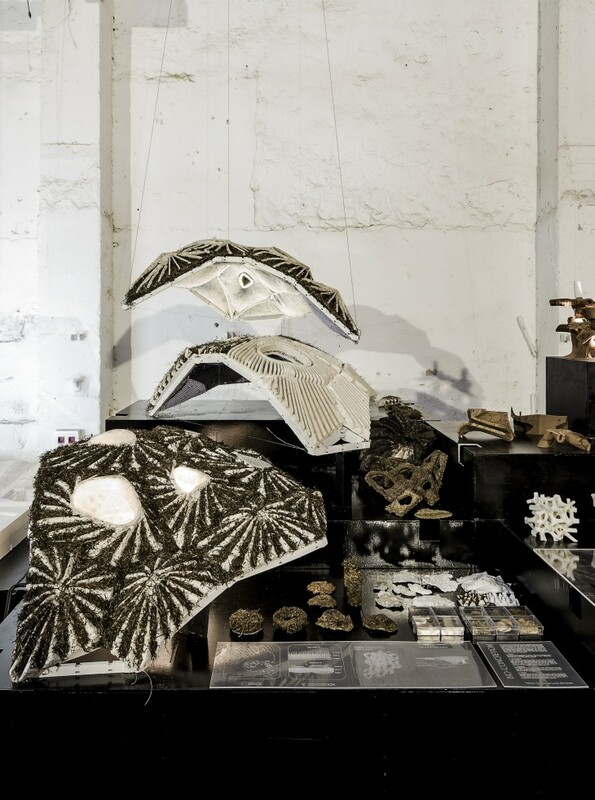 I will therefore use digital computation as the main driver to explore new ways of using seagrass and challenge the shape, creating a competitive and contemporary approach to using the material in architecture. The link between the two ways of constructing is the material and the behaviour of the organic matter and understanding natural processes. 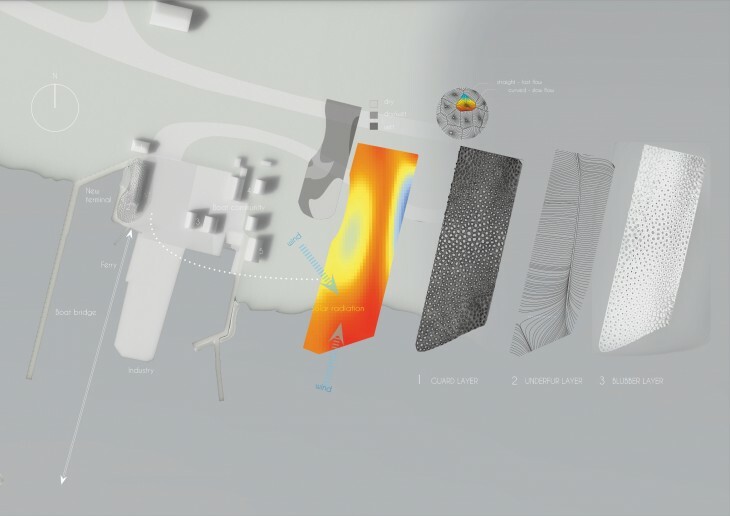 The research will be based on form finding in computational modelling and small scale prototyping. I believe that this part of the thesis will be crucial for the future of the material because of the way in which the material can be understood and lifted into a new time age through my method. I will therefore aim to have the process of the form finding with the seagrass as a centrepiece and the final outcome of the thesis to be exhibited. 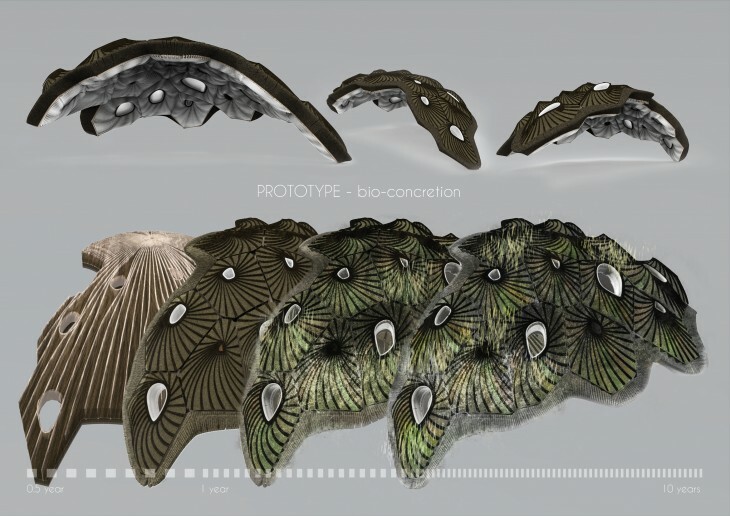 In our present time biology has often been a key to create new systems with materials introducing bio-mimicry.Inventions like Velcro, tanks and airplanes is all studies based on natural phenomenon – “the nature invented it first“. 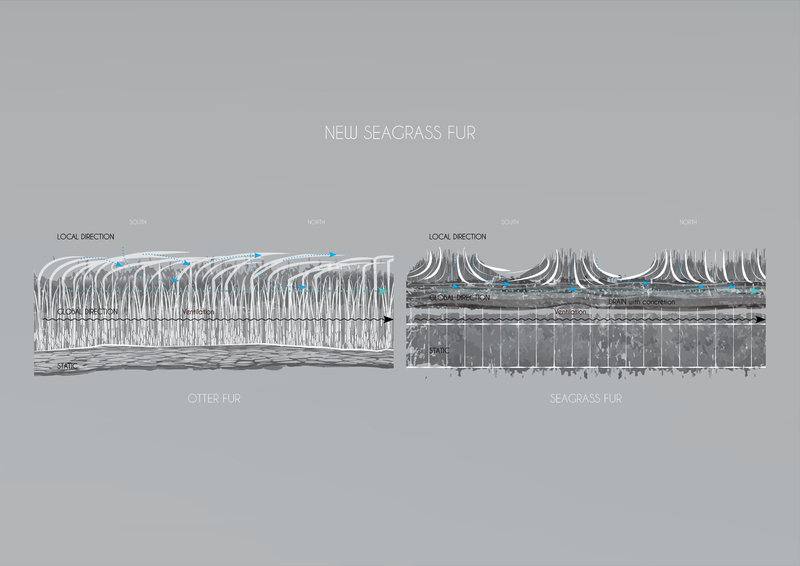 This directs the research to try to understand other natural systems found in the nature which can help to optimize the new language into a new sufficient system of roofs with sea grass. In recent years bio-mimicry has gained strength through researchers such as Janine Benyus and later for example translated into architecture by Michael Pawlin. The research from the two of them will serve to help me how to understand and interpret the life of seagrass from the nature into a system of building with seagrass. In detail I will look in to the phenomenon of furs at animal amphibia species (animal living in water and on land). One of the characteristics of these types of furs is that the water is easily drained away and leaves theinner skin dry and warm. The insulation is not based on blubbers, as marine species normally are, but 100% thefur. This behaviour is what I am looking for in order to optimize the existing system of the seagrass roofs. While the intention is to have a better controlled ecology in the seagrass mass, the nature will obvious be the point of inspiration. Nevertheless, the link to useful computational tools such as solar radiation studies will be crucial and will link the computation design to the local environments. People like Brian Jones (the Rolling Stones) was wearing this kind of haircut during the sixties. His hairstyle was clearly based on a centralised line, and the hair “falling” from this – just as the seagrass roofs are based on the horizontal roof beams, and the fibres are falling down towards the ground. The hairstyle is based on washed hair, which is not more treated, and then fall into place. 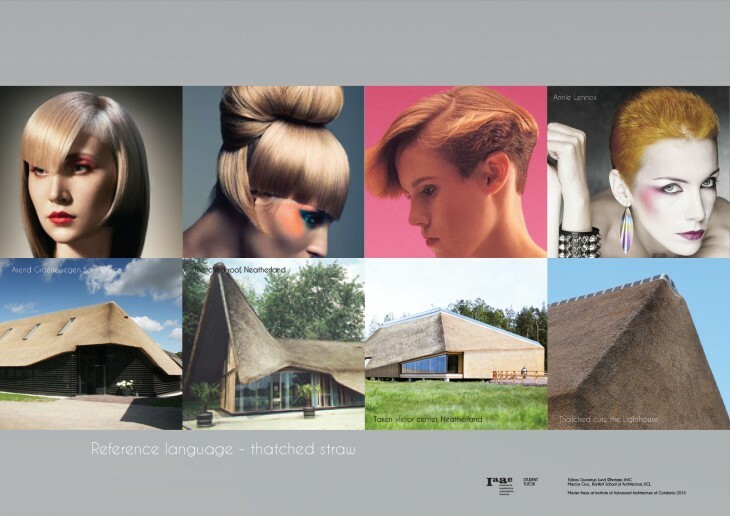 Hairstyles 1980s and 1990s The thatched roofs with straw have a much broader design language. This might be because the tradition is much more wellknown and tested. But it might also be because the fibers are more stiff and easier to group and cut in sharp angles. In the 1980s there where an introduction of a broader selection of hair products. This gave the hairstyles a better chance to become more independent of the gravity. The hair should look more clean and sharp. As well as coloring the hair was more common. The hairstyles were testing the normal and the gravity using these products. The haircut was essential for the hairstyle and needed to be well maintained. So a visit at the hairdresser was needed more than once per year more than in the 1960s (if ever needed). In the “hairstyles of thatched roofs” there lies a great amount of experimentations and refinements. The different compositions is not made, only to make a functional roof/hairstyle, but also giving new aspects of dealing with meeting between openings as doors and windows and introducing the twig. Instead of relying on one massive mass being the roof, the thatched straw roofs were using the direction and cut of the fibers to drain the roofs in a much more sufficient and sophisticated way compared to the seagrass roofs. For me, this is some of the refinements (and details) which lead to grace. Hairstyles 2000s The new ecology of seagrass posses a new design language. 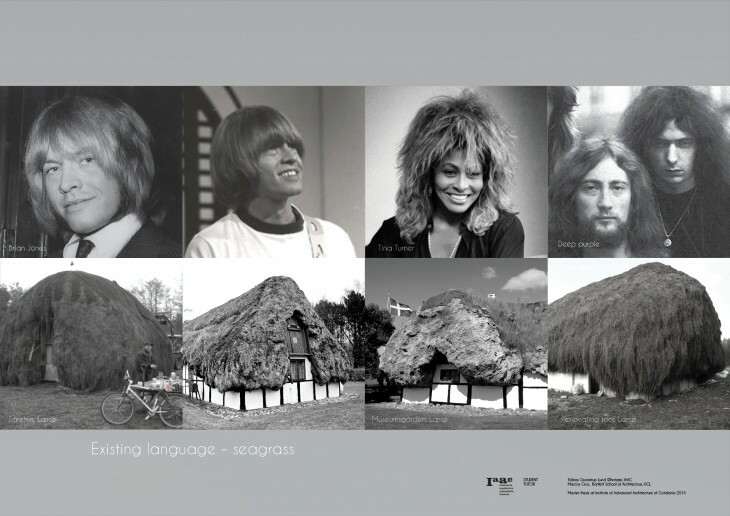 Learned from the tradition of thatching with straw, an optimization is key to create the new language. Grace is not necessarily the end goal, but it is more a generator to explore the opportunities with the seagrass. To me, grace is found everywhere in the nature. The nature has its own complex system to evolve and regenerate itself. Studying different systems from the nature will be my tool in order to to reach the grace in a new design language for seagrass. The system will give the appearance of the complexity and at the same time some kind of an order. 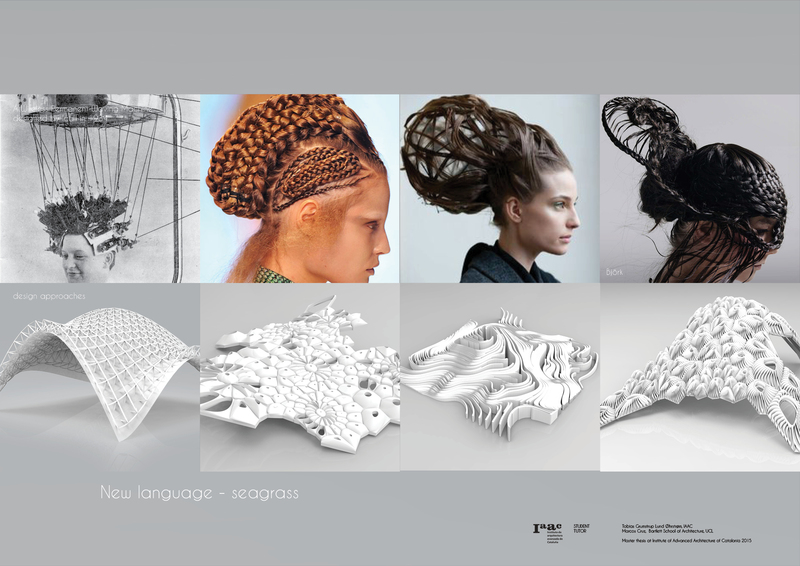 My references for the new language is for example the hairstyle of Björk. Using different systems of weaving, binding and creating different heights, pores and densities, Björk experiments with her hair. Combining this hairstyle with computational design tools and systems from the nature could create a new system and design language. The first approach is to compress the seagrass. The compressing is based on adding an additional material (or the seagrass in another state) to keep the seagrass in pressure by force, and therefore a more compact section of the seagrass can be made. Interlocking the fibers, so they stay into place between gaps. 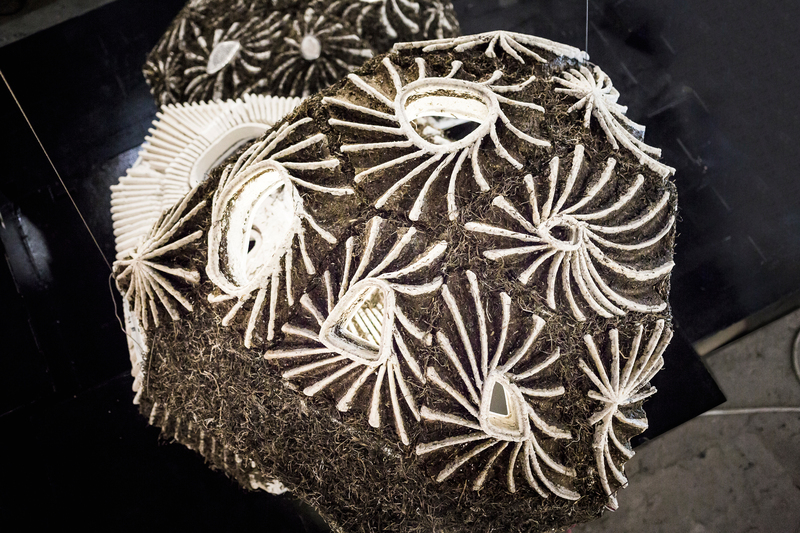 A complex porous structure creating a interlocking system to grap and hold the seagrass. Coming from the old thatching technique from Læsø where they were attaching the twisted seagrass to the beams by weaving the seagrass. New techniques to twist and weave the seagrass should be explored. Forcing the seagrass together with an additional binder. This technique could result in the ability to molt the material, and eventually mill in the material. 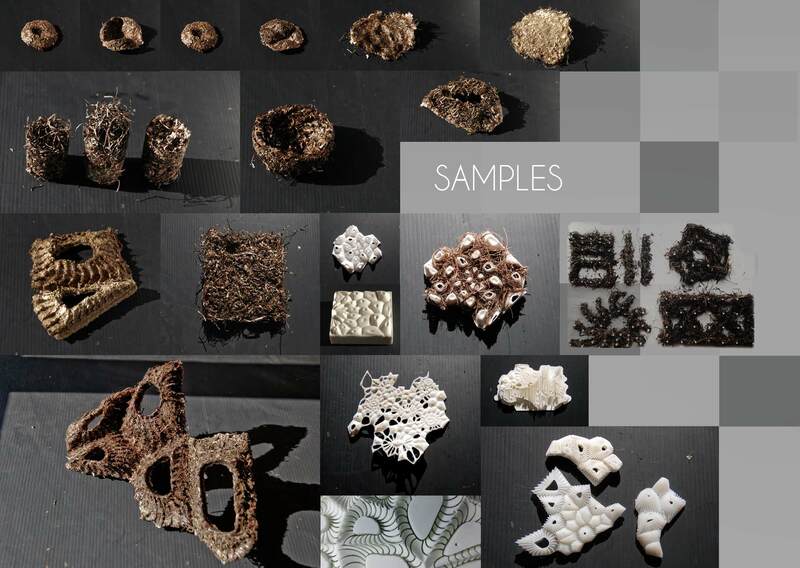 The investigations of shapes, geometries and systems to deal with the seagrass fibers, will be based on mainly system and characteristics from the nature. Example of systems analyzed are fibers of the palm tree, corals and furs. Many of the approaches will not be purely based on one technique, but will be a combination of multiple techniques. These different ways to control the seagrass have each different characters and benefits. To conclude the investigation a catalogue has been made. This catalogue shows basically how to layer the seagrass into a new system. 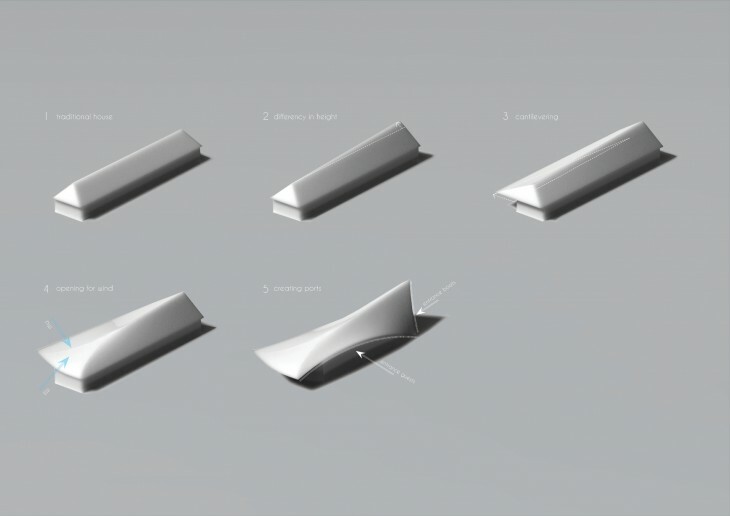 The catalogue is giving the different new compositions properties in terms of creating a new roof system. GUARD LAYER: Guided layer of loose seagrass and molted seagrass. Drain path according to slope angle and solar radiation. UNDERFUR: High density of molted seagrass. Drain path according to the fastest way to the gutter..
BLUBBER: Insulation pillows serves as the visible sealing. Furthermore, by controlling the geometry of the roof it is possible to allow the roof to have different areas with conditions linked to the orientation. The wind in the harbor is coming most likely from southeast and southwest. The wind can help flat areas to dry faster. So towards those directions the roof is getting more flat, enabling the roof to dry faster. Functions and plan The new terminal buildings main function is to serve as an office to the harbor and the ferry. This requires an office which is allocated in the center of the building. The office is connected to a hallway which is dividing the building in two pieces and allowing guests to access the bridge on the other side of the terminal. Facing the water and the open area in the building, is a new café and a waiting area. The roof is cantilevering over the existing bridge of wood and is creating a shelter for the guests who are waiting for the ferry outside. Back in the new terminal, a space for boats are made for surviving the hard winters in Denmark. It functions as a woodshop during the summer. The facade follows the functions: Where the functions are more public, the building opens up and it is more closed in the end of terminal where the storage of boats are allocated.